You’re invited to participate in my crowd sourcing experiment/birthday project. I just turned a quarter of a century old (hooray!) and I wanted to find a unique way to celebrate. Especially since my friends are scattered around the world. 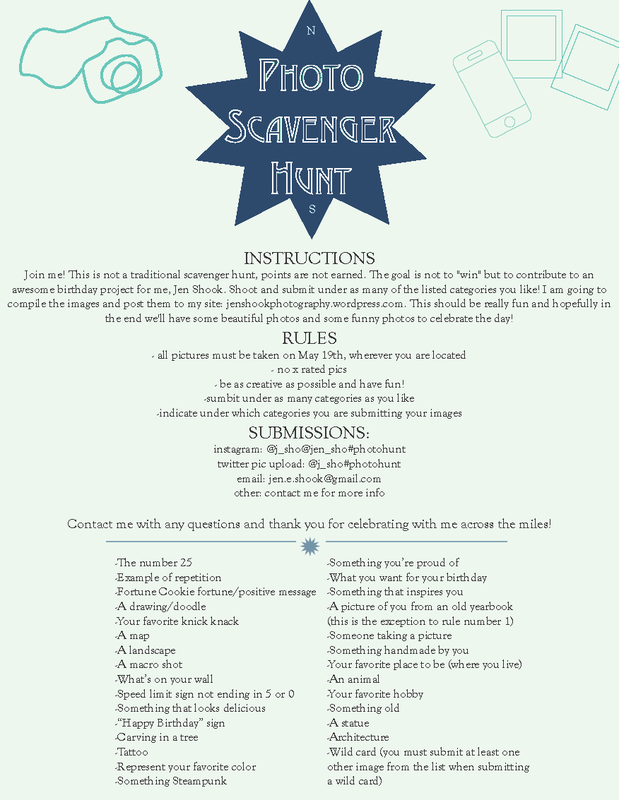 So I came up with a photo scavenger hunt. It’s not a typical scavenger hunt with a goal of winning, but more of an opportunity to share a day through photos with my friends and twitter followers/photo community. Check out the categories, and photograph examples of as many as you like! I’ll be shooting too here in DC. You can shoot with a digital camera, your iPhone, any analog camera, etc. When you’re finished submit the images to me one of these ways: twitter, instagram, flickr, google+, txt msg, email (don’t submit via facebook, please) and include their category. Once I have all the images, I will post them here on my site for everyone to see. Enjoy the day and happy shooting! -contribute to an awesome photo project! Many thanks for participating and for the birthday wishes!